A number of C.N. 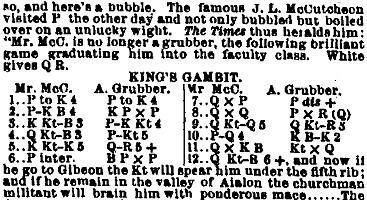 items have discussed a gamelet first published in the nineteenth century. Given that it subsequently appeared in different guises, with various players named, we have split the C.N. items into separate parts, for ease of reference. Any further documentation discovered will be incorporated into the appropriate section. It has not yet been possible to trace the Times item mentioned in the first two cuttings. The references to ‘Joshua’ and ‘Grubber’ have yet to be explained. 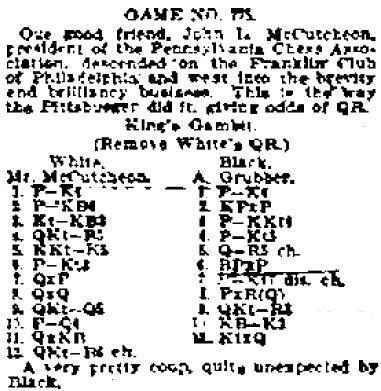 In addition to noting the discrepancies over the identity of the players, the occasion, the conclusion of the game and the question of whether odds were given, our correspondent remarks that such a game (I.O. 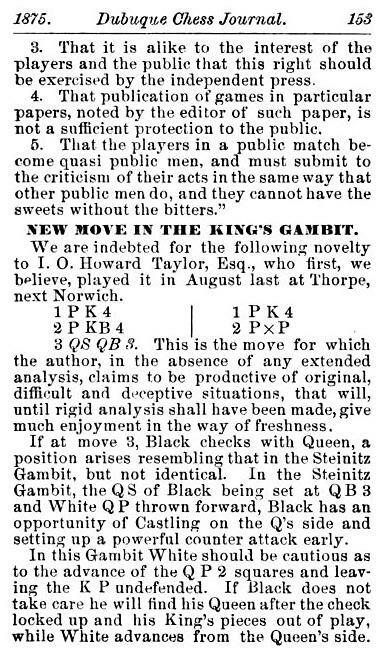 Howard Taylor v N.N., 15 August 1874) had been published on page 155 of the Dubuque Chess Journal, March 1875 and on pages 57-58 of Taylor’s Chess Skirmishes (Norwich, 1889). 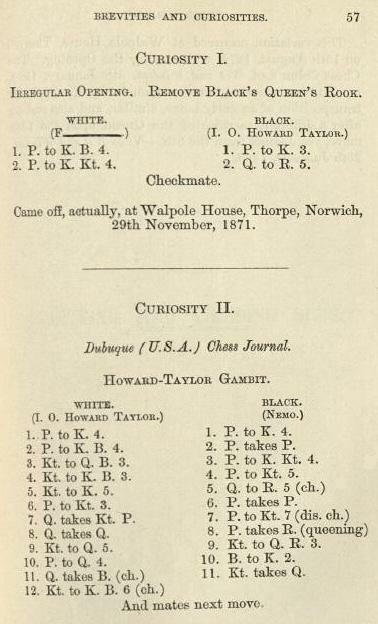 Mr Niessen also pointed out that pages 57-58 of Taylor’s Chess Skirmishes stated that a similar game played by Bird appeared in Wit and Wisdom, 5 January 1889 (a copy of which is sought). Our correspondent believes that 1885 would be correct given that, as reported on page 174 of the May 1885 BCM, Bird gave a simultaneous display in Huddersfield on 28 April 1885. 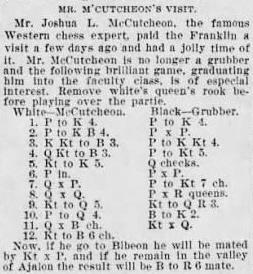 Mr Niessen adds that Otto Brech was the city’s leading player at the end of the 1920s and conducted the local chess column from 1934 until his death in 1937. 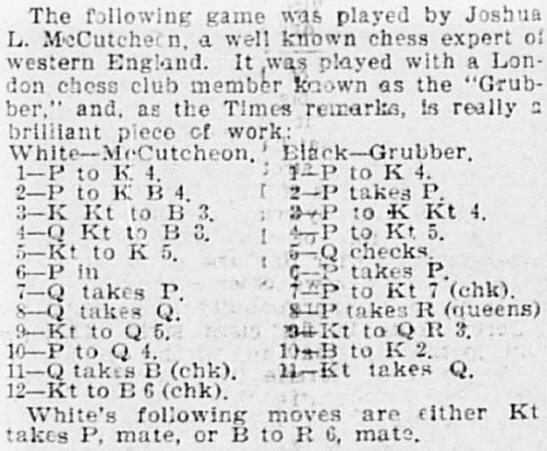 It is unclear why Richter put 1938 for a game which had been published in the Aachener Anzeiger – Politisches Tageblatt on 5 August 1932. 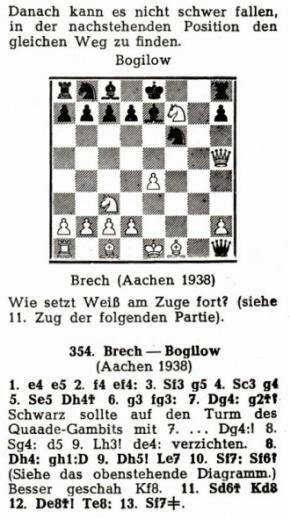 The newspaper called it a ‘freie Partie’ (offhand game) played in Aachen by Brech against Borobiloff. See the Quaade Gambit item below from the Schweizerische Schachzeitung. 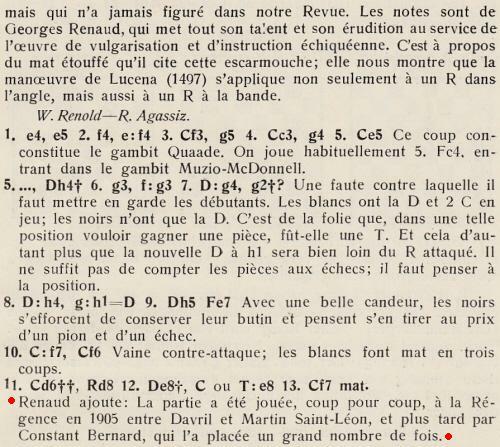 The game was also published on pages 44-46 of L’art de faire mat by G. Renaud and V. Kahn (Monaco, 1947). 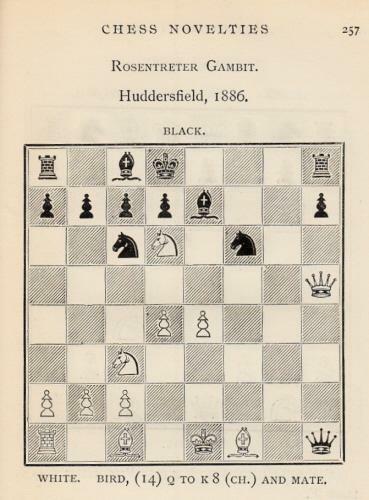 See too pages 39-40 of the English edition, The Art of the Checkmate (New York, 1953), which gave White’s initial as Q. rather than W. Both players’ forenames are available from the Schweizerische Schachzeitung in connection with chess in Lausanne: Wilhelm Renold (March 1903, page 87) and Rodolphe Agassiz (April 1903, page 93). 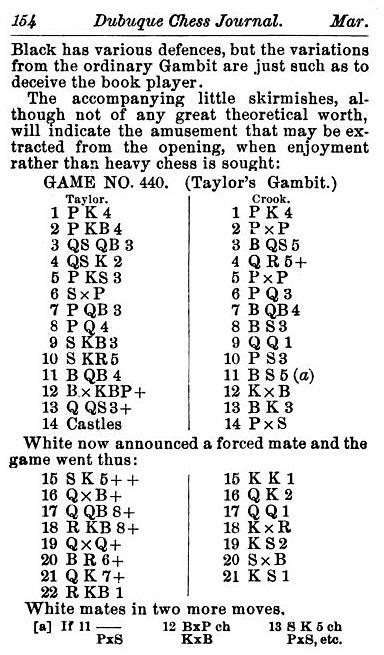 The French and English editions of Renaud and Kahn’s book misspelled the opening of the game (‘Quade Gambit’). 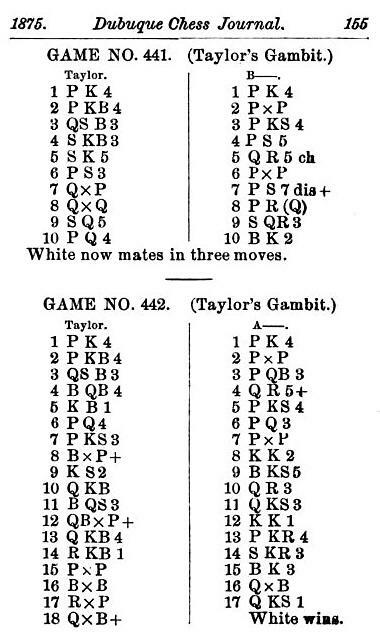 There was material on the Quaade Gambit by W. Timbrell Pierce on pages 138-139 of the April 1913 BCM, with analytical comments from a correspondent, W.M. Hardman, on page 183 of the May 1913 issue and a reply from Pierce on page 236 of the June 1913 number. His name was also given on pages 193 and 196 of the July 1884 Deutsche Schachzeitung and on page 228 of the August issue. There are two genealogical sources online for a sea captain named Louis Magnus Johan Christian Carl Quaade, who was born in Helsingør on 7 March 1825 and died in Oringe/Vordingborg on 13 September 1906. See My Heritage and Geni. 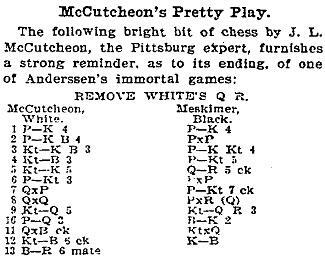 Henk Smout (Leiden, the Netherlands), who has also mentioned the references to Quaade in the Deutsche Schachzeitung, points out with regard to the extract shown above that the Oxford Companion to Chess erred by putting ‘D.L. Quaade’. When the Deutsche Schachzeitung referred to ‘dem Kapitän a. D. L. Quaade’ it was using the German abbreviation ‘a. D.’, meaning außer Dienst (retired). Concerning the references to Danish/Dutch, we wonder whether Oringe (Denmark) was simply confused with Orange (as in William of Orange). Latest update: 15 March 2014.